Robert Tyre "Bobby" Jones Jr. is most famous for his unique "Grand Slam," consisting of his victory in all four major golf tournaments of his era (the open and amateur championships in both the U.S. & Britain) in a single calendar year (1930). Jones founded and helped design the Augusta National Golf Club, and co-founded the Masters Tournament. In all Jones played in 31 majors, winning 13 and placing among the top ten finishers 27 times. 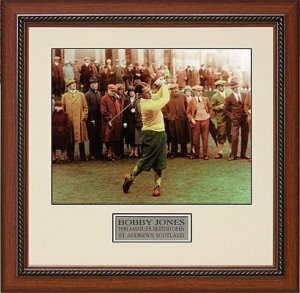 This is a Bobby Jones unautographed 8x10 photo from the 1930 British Open-Custom Framed and Matted.